We are pleased to welcome a new Principal to our Group: Dr. Adie Whitaker. 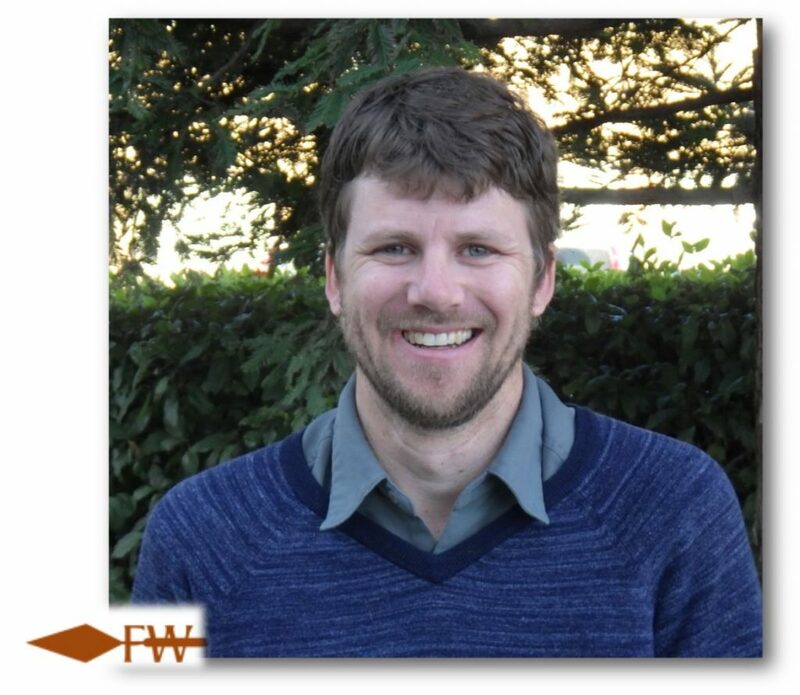 Dr. Whitaker has been with Far Western since 2008 and has over 15 years of archaeological experience in California CRM. He has authored numerous reports on the archaeology of California, while leading inventory and excavation projects from the San Francisco Bay to the Sierra Nevada to the Channel Islands. Building on data collected and collaborations formed during these projects, Adie has published numerous scholarly articles in regional, national, and international journals, including American Antiquity, the Journal of Anthropological Archaeology, the Journal of Archaeological Science, the Journal of Coastal and Island Archaeology, California Archaeology, and the Journal of California and Great Basin Anthropology. He is Editor of the Journal of California and Great Basin Anthropology and continues to play a strong role in the Society for California Archaeology. Far Western will benefit greatly from Adie’s enthusiasm and leadership. We value his ability to meet the compliance needs of our clients while expanding our knowledge of California’s past. The report, authored by Allika Ruby and Patricia Mikkelsen, was a collaborative effort. Supporting authors included Philip Kaijankoski, Eric Wohlgemuth, Angela Arpaia, Lucas Martindale Johnson, Andrew Ugan, William Hildebrandt, John R. Johnson, and Nathan Stevens. Terry Joslin with the California Department of Transportation was involved throughout, as were Barbareño Chumash representatives who monitored all excavation work—Gilbert Unzueta, Isa Folkes, and David Dias. 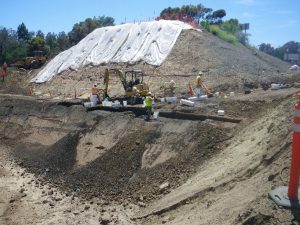 The Las Vegas and San Pedro Creeks Capacity Improvements Project involved culvert replacement for flood control along US Route 101 near the city of Goleta, Santa Barbara County. A huge box culvert lay in a rechanneled drainage, stretching under railroad tracks, multi-lane Route 101, and an off-ramp. There were also two known sites either side of the highway, in a very urban environment, one occupied early in time—CA-SBA-1703—the other a named ethnographic village—S’axpilil’s (SBA-60). The sites are just north of Goleta Slough at the confluence of two creeks, an area with archaeological evidence shoring focused settlement for thousands of years. How could any intact cultural deposits survive in such an environment? Through experience and skill, geoarchaeologist Phil Kaijankoski identified intact versus disturbed deposits. We then quickly developed a work plan to recover maximum information in a hectic environment using appropriate and diverse field techniques. Back at the lab, we analyzed and interpreted the data, focusing on the identification of discrete temporal components. We had to determine if the deposit was associated with SBA-60 or SBA-1703; it was geographically right in-between. Geoarchaeologist Kaijankoski noted that the newly identified deposit lay on an ancient fan, as did SBA-1703, whereas SBA-60 sat on a youthful floodplain. Initial dating and artifact analyses confirmed the site deposit on the western slope was clearly associated with the older occupation at SBA-1703, dated to around 3700-2400 cal BP. A few Late Period artifacts, especially in the mixed eastern slope, indicated some overlap between the two sites. Whistle with Asphaltum-embedded Shell. Post-900 cal BP. Click image to view in 3D! Given diverse, abundant artifacts, along with intact features, Far Western was able to undertake in-depth analyses and focus on addressing current avenues of research. The data presentation was geared to students of cultural resource management as the project highlighted the persistence of intact cultural resources in highly disturbed environment, and innovative methods to retrieve, analyze, and document findings. The project presented such an important learning opportunity, that Far Western felt obligated to share it as much as possible, in a format that was readable, educational, and exciting. Therefore, a visually appealing document specifically geared to archaeology students focusing on cultural resources management and contract archaeology was created. an in-depth study of geoarchaeology, noting the importance of a study of soils and soil transitions, is important to geologists and archaeologists. Study questions were also prepared, relating to important aspects of the field work and research. Far Western provided the report and study questions to seven regional institutions to be incorporated into lesson plans; they have already been used in several classroom settings, with positive feedback. Another key component of the project was the presence of the local Native American community. The monitors were provided copies of the case study; each encouraged the use of Salvaging the Past in archaeology classrooms. The ethnographic studies of Dr. John R. Johnson for this project emphasize the larger social network that existed at the time. This information is only available from extensive mission record studies. 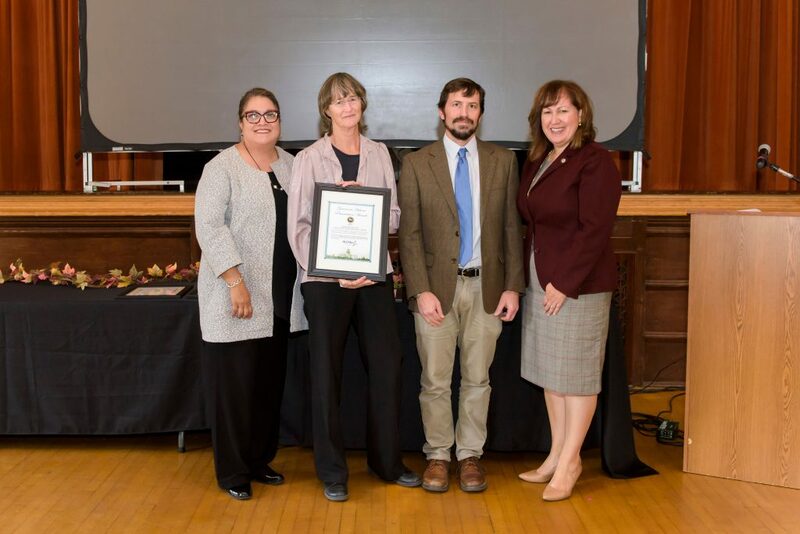 Far Western was awarded one of the coveted 2016 Governor’s Historic Preservation Awards for the Cuyama Valley – A Corridor to the Past project. The California Office of Historic Preservation chose the project as an exceptional example of historic preservation efforts on behalf of California’s cultural heritage. The project, directed by Far Western Project Manager and Principal Investigator Patricia Mikkelsen, was a collaborative effort among the Native Chumash community, the District 5 Central Coast Specialist Branch of the California Department of Transportation, the Santa Barbara Museum of Natural History, Foothill Resources, and Tiley Research. Excavation of the ethnographic village of Wenexe’l taken in 1970 by Crew Chief Al McCurdy. This impressive saucer-shaped depression was characterized by burned timbers, postholes, and hearth/pit features. Recovered artifacts from within the depression included flaked and ground stone tools, shell and stone beads, modified bone, bones, shell, and historic-period material such as glass beads and roof tiles. It dates to the Late Period-Historic-era, 600 cal BP–1806 AD. Cuyama Valley – A Corridor to the Past showcases seven archaeological sites that underwent initial salvage excavations in the late 1960s and early 1970s, with final analysis nearly 40 years later. The California Division of Highways (precursor to the California Department of Transportation [Caltrans]) carried out three highway realignment projects along State Route 166 in Cuyama Valley. As the project pre-dated the birth of modern Cultural Resources Management practices (i.e., funding was not set aside for analysis of cultural materials unearthed during infrastructure projects), the assemblage was never formally documented. As a result, the collection sat untouched in the UC Santa Barbara archives. Dr. Valerie Levulett, Chief of the Caltrans Central Coast Environmental Specialist Branch and one of the original archaeologists who participated in the salvage excavation work, submitted a Caltrans Transportation Enhancement grant proposal to address the long-delayed processing of these important collections. 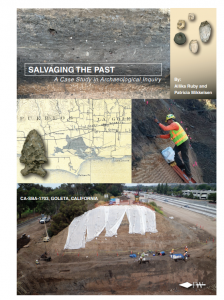 With the grant approved, Far Western, under a Caltrans cultural resources on-call contract, was tasked with the challenge of not only analyzing the collection, but recreating the excavation itself through numerous field and photograph logs, field notes, and maps. Far Western also reached out to others who were part of the original project, including Dr. Jeanne Binning, Al McCurdy, and Max Farrar, to help set the scene. Prior to this endeavor, little was known about Cuyama Valley prehistory. 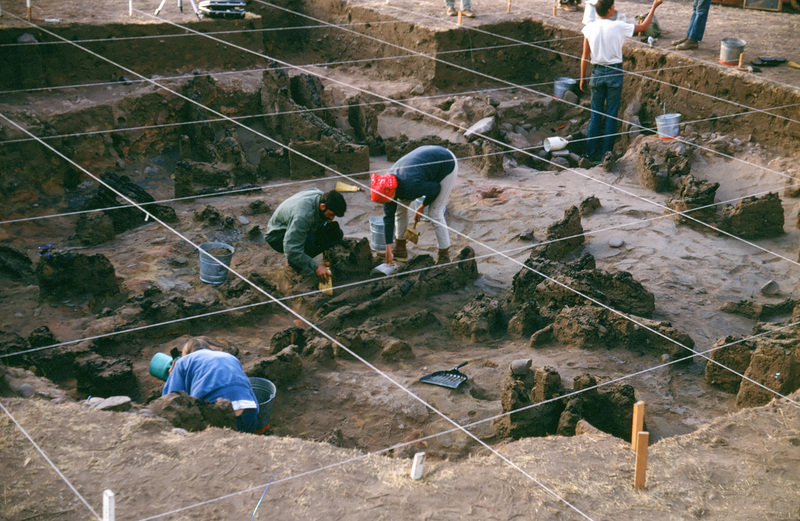 Minimal formal archaeological work and few publications have focused on the valley—a corridor that once connected the prehistoric population centers of the Central Valley and Central Coast. The data compilation brought to light a wealth of information about the history and lifeways of the Native people of the region. Far Western catalogued approximately 3,000 flaked and ground stone tools, including over 400 projectile points, and nearly 5,000 shell, stone, and glass beads and ornaments. These types of discoveries allow for an array of research opportunities and contributions to the archaeology, ethnography, and history of the region. Patterns of technology, settlement, and social interactions. Development of adjacent road- and highway-related features that have encroached upon the seven Cuyama Valley sites. Far Western Art Director Tammara Norton worked closely with members of the Northern, Barbareño, and Ventureño Chumash tribes to create the displays depicted above for their use in educating the public about the unique prehistory of Cuyama Valley. 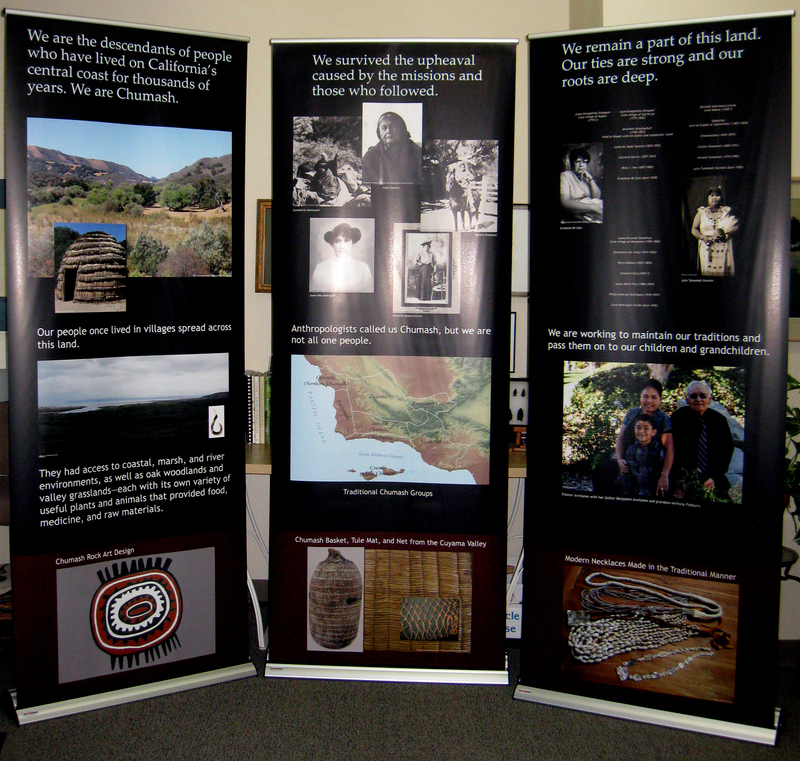 Each tribe received a set of three portable exhibits designed to their specifications, for public outreach and education. 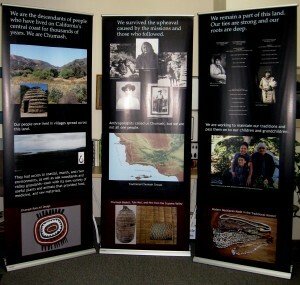 The project produced four genres of public-oriented interpretive material designed in collaboration with individuals from the Northern, Barbareño, and Ventureño Chumash tribes for use in educating the public about the unique prehistory of Cuyama Valley—a booklet, exhibits, bookmarks, and tool replicas. Far Western prepared a full-color, 70-page booklet, entitled The Long Road Traveled – Archaeology, Native Americans, and Europeans in Cuyama Valley, which discusses the Cuyama Valley project, the region’s prehistory and history, Chumash culture, and living descendants. It concludes with a short glossary of archaeological terms and suggestions for further reading. Caltrans printed 1,000 booklets and distributed them free to Native Americans, Cuyama Valley residents, the Santa Barbara Museum of Natural History, and local libraries, museums, and schools. 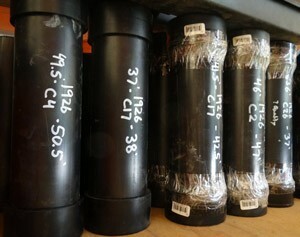 Cores in the Far Western Geoarchaeology Lab. Cores upon cores fill the shelves of the Far Western Geoarchaeology Lab in Davis. 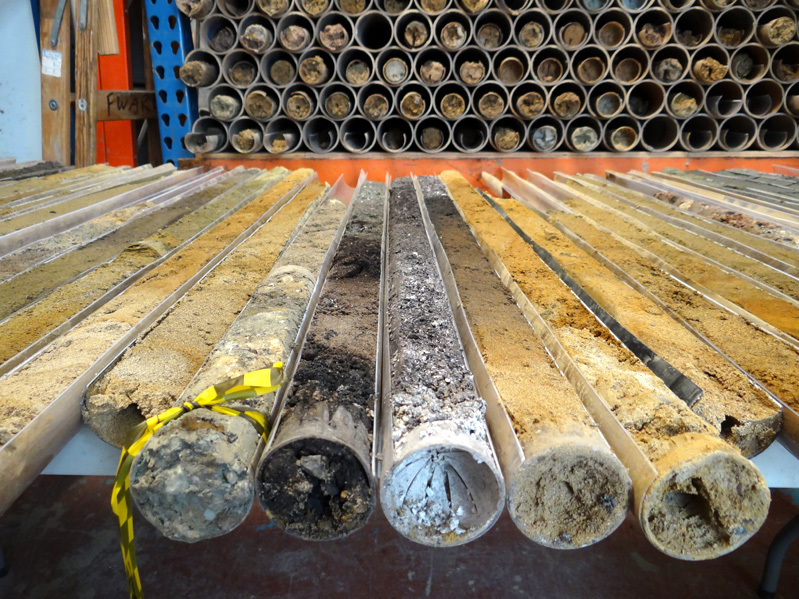 These long tubes of “dirt” tell us a lot about prehistoric landscape evolution, and thus can help determine whether or not a location might have potential for archaeological findings. In most situations, backhoe trenching is the most effective way to identify sites. 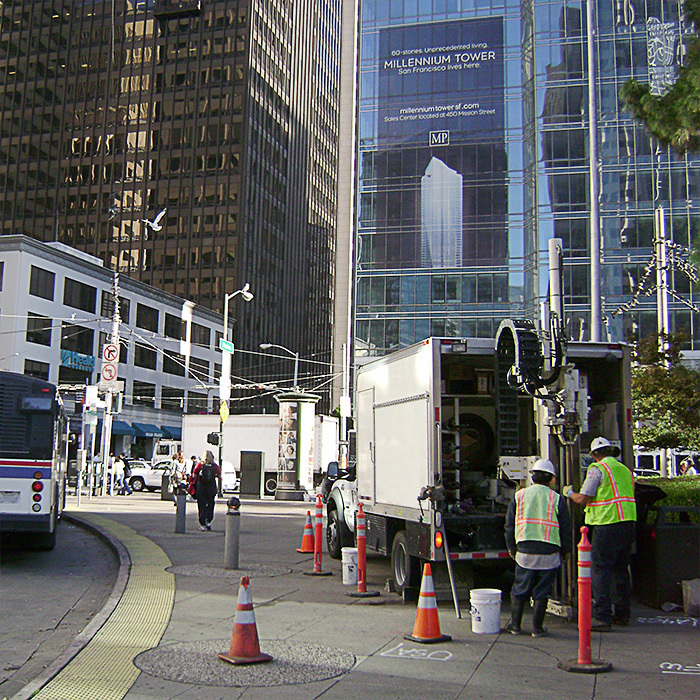 When backhoe trenching is not possible, in urban areas for example, or when the potential depth for a site exceeds the range of mechanical excavation, we conduct hydraulic continuous-core sampling to identify sites. When archaeologists dig through the layers of earth carefully, the different soils and buried surfaces can be visually seen. Cores do the same thing, like inserting a straw into a layer cake, sometimes reaching 65 feet below surface. Each four-foot section of the core is pulled up in two-inch-diameter plastic liners, brought to the lab, sliced down the center, and splayed open to reveal the stratigraphic layers. Dating the layers can be done in a couple of ways. Most often, radiocarbon dating is used to get close estimates of how old plant, bone, or shell is in a certain layer, or when now buried surfaces were exposed at the surface. Other times, however, there is not enough organic matter to be sampled. In those cases, Optically Stimulated Luminescence (OSL) dating can be used. OSL samples must be removed from their original location in complete darkness, and kept in the dark until tested to provide accurate dates. 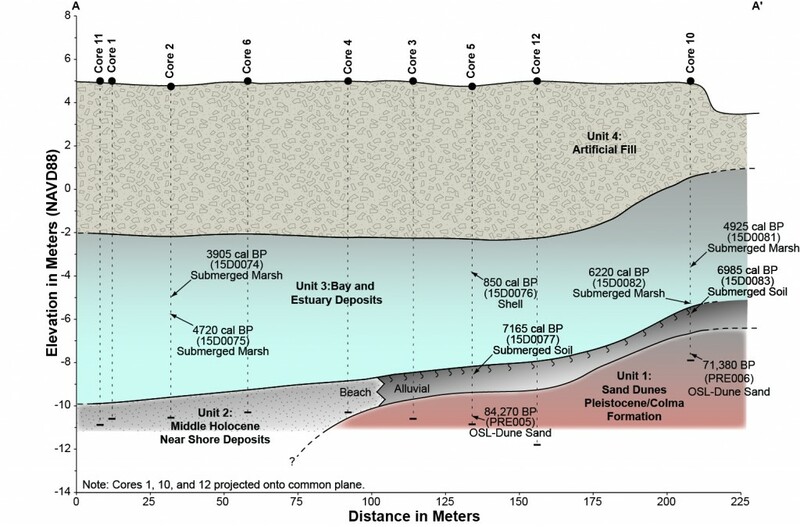 The dates for each layer let geoarchaeologists map similar types of strata throughout a particular location. This helps archaeologists figure out where sites might be buried. Schematic Cross Section of Study Area in San Francisco. 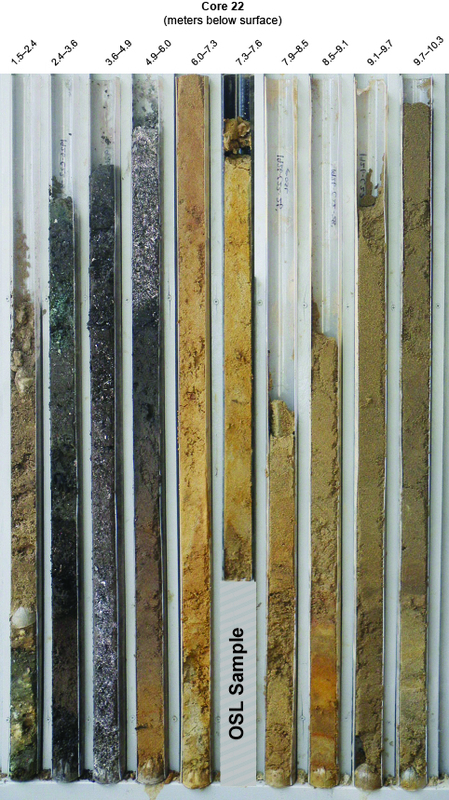 Recently opened core exposing artificial fill at the surface (~1.5–2.4 meters below surface), underlain by recent alluvium (~2.5–3.5 meters below surface), and followed in turn by a dense prehistoric shell midden (~3.5–5.5 meters below surface) formed on a Pleistocene-age sand dune (starting ~5.5 meters below surface). Once buried land surfaces are identified in the cores, they can be sampled to not only determine their age and whether they contain archaeological materials, but also tested to see what types of small seeds, pollen, or other diagnostic material. This can be used to reconstruct the type of landscape that was present when that layer was at or near the surface. 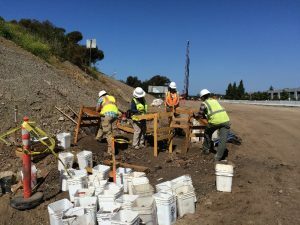 Currently, Far Western Geoarchaeologists are using cores to map the potential for intact buried land surfaces below the historic-era extent of the San Francisco Bay. As ocean levels have risen, they have covered up landforms where people once lived. Recent findings indicate that we may be able to quite accurately map where some people lived for long periods of time, and perhaps returned over and over again generations later. For interested archaeologists and non-archaeologists alike, we suggest reading: Waters, Michael R.,1992, Principles of Geoarchaeology: A North American Perspective. The University of Arizona Press. 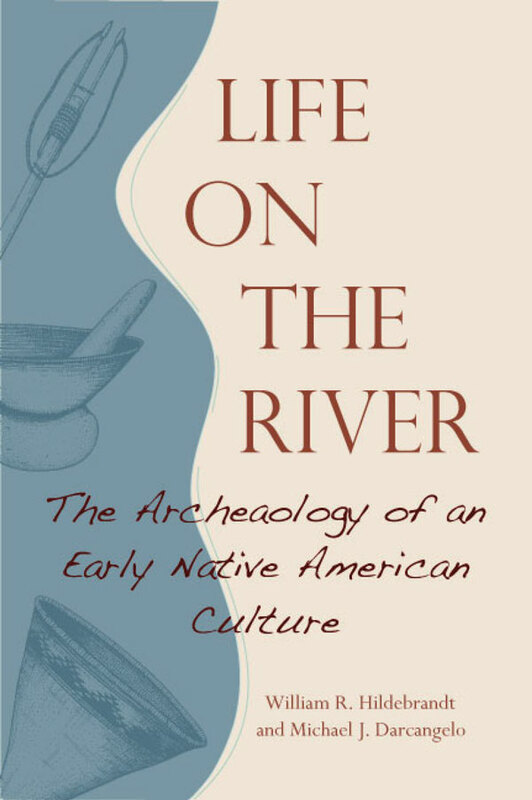 Instructors often request Life on the River – The Archaeology of an Early Native American Culture for use in their classrooms only to find out that it is now out of print. With permission from Heyday Books, Life on the River, by Far Western authors William Hildebrandt and Michael Darcangelo, is now available online for instructors, students, and others curious about Sacramento Valley archaeology. The book describes archaeological techniques and discoveries found at a Shasta County site, located on the Upper Sacramento River. It details Wintu lifeways just before and during the arrival of Europeans. Click HERE to open the PDF! You can also find the book under our Public Outreach and Interpretation page, along with other Far Western outreach projects, PDFs, and videos. During the summer of 2005, thirty-six acres along the Sacramento River were subdivided into six residential lots. The land lies in Shasta County, about six miles south of Redding, California, within the original homeland of the Wintu Indians. One of the prime lots contained an archaeological site officially registered as CA-SHA-1043 and subsequently given the Wintu name “Kum Bay Xerel” (Shady Oak Village; Figure 1). After several failed attempts to develop construction plans that could avoid the site, the landowner decided that the project should move forward, but only after an archaeological excavation. 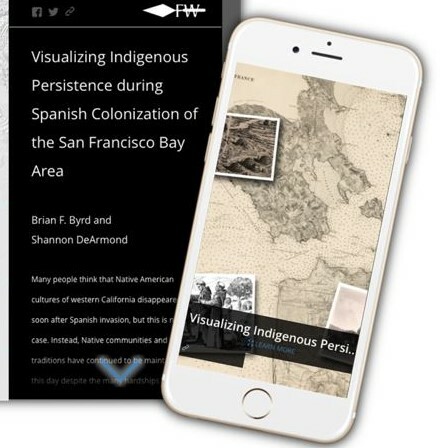 The excavations were carried out by the authors of this publication and other members of the Far Western Anthropological Research Group, with help from several Wintu tribal members and professional volunteers from throughout northern California…read more! Join Putah Creek Council’s third CreekSpeak talk of 2015 on July 2, 2015, by Far Western’s Adrian Whitaker. CreekSpeak is Putah Creek Council’s six-month series of community talks about the nature, culture, and history of the Davis region. Have you ever wondered who used to live along Putah Creek? Humans have lived along the shores of Putah Creek and other tributaries of the Sacramento River for thousands of years and the physical remains of their activities are preserved in a rich archaeological record. 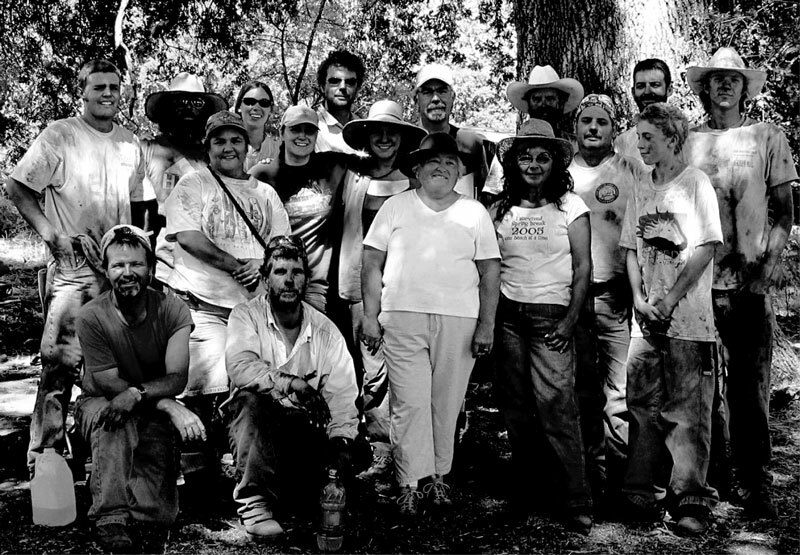 Join us as we learn about the earliest human settlers around Putah Creek, the resources they relied on, and what the archaeological record can tell us about the past ecology of the creek and watershed. We will also explore the need and process of preserving archaeological resources as part of our shared cultural heritage. CreekSpeak talks are free to Putah Creek Council members and open to the public. A $5 donation is requested from those who have not yet joined the Council. Far Western recently completed work on the Truckee River Legacy Trail in Nevada County, California. This long-term contract included site evaluations, data recovery, public interpretation, and a series of reports and treatment plans for the California Department of Transportation, the Tahoe National Forest, and the Town of Truckee, California. Dr. Susan Lindström, Zeier & Associates, and Penny Rucks Ethnographic Services worked with Far Western on various aspects of the project. Sharon A. Waechter and Tammara Ekness-Norton designed 15 trail-side panels, as well as a trail map and brochure. The Truckee River Legacy Trail has been chosen as one of the three finalists in the Bicycle/Pedestrian Trail category for a Transportation Award from the California Transportation Foundation (CTF). 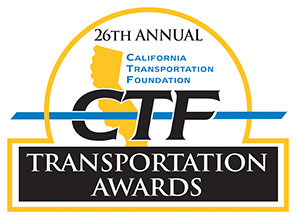 Anne Mayer, Chairperson of the CTF Awards Committee, noted that the finalists “represent the best of the projects, programs, and people who made a positive difference for California transportation in 2014.” The winner will be announced at a luncheon on May 21, 2015. For more information on the Truckee River Legacy Trail see our featured project page HERE! See all Finalists for the California Transportation Foundation Awards HERE! Liz joined Far Western in 1985 during our first large-scale project, the Shasta I-5 investigations, and quickly became an integral part of the Far Western family. As Lab Director for more than 25 years, she played an important role in virtually every project: processing and organizing field collections and site paperwork; submitting samples for radiocarbon dating, obsidian studies, faunal identification, and other special analyses; creating databases for artifact cataloguing; doing lithic analysis; arranging for long-term curation of site collections; and training untold numbers of lab technicians to meet her exacting standards. 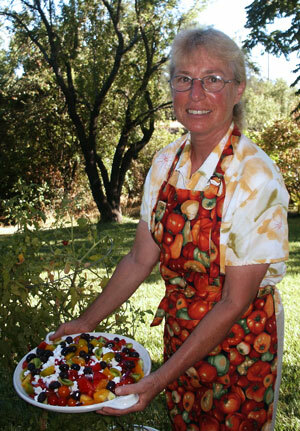 And she still had time to raise chickens and grow prize-winning tomatoes! Thank you, Liz for being an essential member of the Far Western team. You (and your wonderful seasonal produce) will be sorely missed. Cheers to you and best wishes for your new adventures! 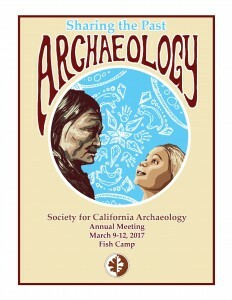 The Martin A. Baumhoff Special Achievement Award is given for lifetime contributions to California archaeology. The award focuses on an individual’s career accomplishments, personal and professional highlights, scope of influence, and other achievements. At the 2015 Society for California Archaeology (SCA) Conference, this March, Far Western’s founding member William Hildebrandt received the Baumhoff Special Achievement Award, presented by Kelly McGuire at the banquet event. We are honored as a company to benefit from his lifetime of dedication to and professional achievements in the field of archaeology. The Golden Shovel Award recipient Edward Mike was introduced by Far Western Senior Archaeologist Michael Darcangelo. Ed has worked with Far Western for over twenty years. Patricia Mikkelsen was also awarded the President’s Award for Exceptional Service to the SCA. Laura Brink presented Patrilocal Post-Marital Residence and Bride Service in the Early Period: Strontium Isotope Evidence from CA-SJO-112, a paper she co-authored with Jelmer Eerkens and Candice Ralston. Laura also co-authored a second paper, Trophy Heads or Ancestor Veneration? A Stable Isotope Perspective on Disassociated and Modified Crania in Pre-contact Central California with Jelmer Eerkens, Eric J. Bartelink, Richard T. Fitzgerald, Ramona Garibay, Gina A. Jorgenson, and Randy S. Wiberg. Kaely Colligan served as this year’s Program Chair, gave the Welcome speech and organized the Plenary Session Beyond Boundaries, as well as co-authored Small Sites with Big Potential: Survey Results from the Cabrillo College Field School with Dustin McKenzie, Emily Bales, and Violet Navarrete. Jill Eubanks presented The Importance of Field Records, Notes, and Maps for Future Research at the Poster Symposium. Molly Fogarty and Stephen Hennek instructed the workshop Can I Touch It? : Workflows to Create Journal-Quality Images and Interactive Graphics with 3D Scanning and Photography. William Hildebrandt was a symposium discussant and presented Native American Rock Features from South-Central Oregon and Northeastern California, a paper he co-authored with Paul Brandy, Nathan Stevens, and Amy Foutch Porras. Philip Kaijankoski presented his poster Assembling the East Bay: Subsurface Geoarchaeological Explorations for the Silicon Valley-Berryessa BART Extension Project. Jack Meyer and Jeffrey Rosenthal co-authored Paleodietary Analysis of a Central California (CA-CCO-696) Burial Population using Stable Carbon and Nitrogen Isotopes with Candice Ralston and Jelmer Eerkens. Patricia Mikkelsen introduced the Poster Symposium and also presented her poster Prehistoric Structures and Yucca Roasting Ovens in Cuyama Valley. She gave out over 100 copies of The Long Road Traveled. Mark Hylkema and Far Western’s Tammara Norton designed the Program cover, the Archaeology Month Poster, and stunning labels for wine bottles this year. Jeffrey Rosenthal also co-authored Using XRF to Reconstruct Mobility at the Skyrocket Site (CA-CAL-629/630) with Carly S. Whelan, John H. Pryor, and Jeffrey R. Ferguson. Allika Ruby co-authored The Antiquity of Patwin Occupation in the Capay Valley of Central California with Al Schwitalla, and Mike Taggart. Nathan Stevens presented Changes in Technology in the Cuyama Archaeological Record at the Poster Symposium, and he also presented A Reevalutaion of Tuscan Obsidian Hydration, which he co-authored with Michael Darcangelo. Eric Wohlgemuth presented Change and Stability in Late Holocene Plant Use in the Cuyama River Canyon at the Poster Symposium. A huge thank you to the fantastic Far Western staff including Kathleen Montgomery, Nicole Birney and the Graphic Design and Publishing Department; Art Director Tammara Norton; and Paul Brandy, Jill Bradeen, and the GIS and Cartography Department for their extraordinary work creating maps and graphics for the posters and slide shows for those who presented. Also, thank you to the wonderful Administration Department for their cool and collected organizational skills and helpful work in support of the Far Western contributions to the conference.